Ballet Shoes is the story of the adopted Fossil sisters: Pauline, Petrova and Posy. Their peculiar surname’s original has to do the fact that all three of them were found and brought home by Matthew Brown, a fossil collector, who left them under the care of his great-niece Sylvia and her old nurse, Nana. After bringing home the youngest of the sisters, Great Uncle Matthew embarked on an expedition, leaving behind enough money to support the family for five years. Only the five years pass, and still there’s no sign of him. Sylvia, Nana and the Fossil sisters have to come up with inventive ways to make ends meet. They decide to let some of the rooms in their big house, and one of the boarders, Miss Dane, turns out to be a dance instructor, who suggests that the sisters learn ballet and stage performance. And so it begins. The “show business” side of Ballet Shoes was interesting (I especially liked the details of the production of A Midsummer’s Night Dream that Pauline and Petrova are in), but what really drew me in were the characters and their relationships. I came to Noel Streatfeild the wrong way around, so to speak. The first thing of hers I ever read was one of her books for adults, Saplings. I absolutely loved it, especially for its psychological insight and complex characterisation, and I was looking for a little bit of the same here. Ballet Shoes is of course a different sort of book altogether, but it was still perceptive enough to satisfy me. We never get inside Posy’s head (I wonder why Streatfeild made that choice? ), but Pauline and Petrova’s thoughts always rang absolutely true. I loved how well Noel Streatfeild captured these children’s loyalties, their preferences, their ambitions, the misunderstandings behind their small or not so small hurts. More than about the world of stage performance, this is a book about family, about relationships; about people faced with hardships struggling together and trying hard not end up resenting one another for a situation that isn’t really anyone’s fault. Sylvia, Nana and the boarders that befriend the children always deal with their feelings with such tact – that kind of respect for the emotional experiences of children was another one of the things I loved the most about Saplings, so I was thrilled to also find it in Ballet Shoes. You know, I vehemently oppose the idea that books have due dates, or that you have to read certain things by a certain age to truly “get” them (though you could, of course, argue I'm only saying this because I read so little as a child). All the same, the experience of reading as a child is different from that of reading as an adult – you connect to things at a different level, and the world of the book, the character, the stories, often feel so much larger when you’re young. 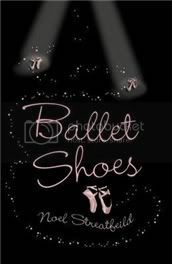 I wish I could have had both experiences with certain books, and Ballet Shoes is one of them. I’m sure this is a story that would have felt larger to me back then. To be specific, there’s something about how I experienced the passing of time in the book that I think would have worked better had I been younger. Somehow, the story didn’t seem to cover as many years as it actually covered; only I don’t think a child would perceive the way time passes in the book the same way at all. But anyway. I most certainly did enjoy it – especially the characterisation, the humour, and the warmth. And also the fact that, as I was saying about Saffy’s Angel the other day, this is a kind book. Speaking of which – I was intrigued by the fact that Ballet Shoes seems to have a dark twin in Noel Streatfeild’s first novel for adults, The Whicharts. The books essentially have the same plot and even share some passages, only in The Whicharts, things don’t go nearly as well as they do in Ballet Shoes. Has anyone read it? Would you like to? Some readers at The Fossil Cupboard, the Noel Streatfeild discussion forums, were saying that reading it sort of spoiled Ballet Shoes for them – it’s apparently quite a depressing book, and now they can’t shake off the feeling that the story told in The Whicharts is what “really” happened, whereas Ballet Shows is the fairy tale version. I don’t think that would happen to me, though, and I must say I’m really curious. The only problem was that the book was out of print for years, and used copies became prohibitively expensive. Fortunately, it seems that a small publisher is bringing it back into print, but I must say I don’t quite know what to make of the fact that the only information I can find for the publisher at all is a page through which to order The Whicharts. Hmm. What do you think? Doctor Jakes came over to the shelves. Pauline looked at the shelves. These books certainly were grand-looking – all smooth shiny covers, and lots of gold on them. Pauline came to the fire. It was a lovely fire; she stood looking at the logs on it. Doctor Jakes: a woman after my own heart. I actually haven’t read Peter Rabbit, but I still appreciate the sentiment immensely. I loved Ballet Shoes when I was little and coincidentally have just obtained a copy of The whicharts - I haven't yet read it so will be interested to read it - I didn't know anything about it, least of all that it was a "real" story of ballet shoes, just wanted it because it was by Streatfeidl. I missed reading Ballet Shoes as a child , too. Glad to hear it's not too late! Ballet Shoes was one of my favourite books growing up together with White Boots (which is about ice skating). I loved the chapters when the three girls were small and starting their education, getting help from everyone who was living in the house. I always felt, even as a child, that Streatfield's prose had an undercurrent of uneasiness that thing's weren't really that rosy as you grew older. I haven't read any Streatfield since, but am very curious abuot The Whicharts. I really like books that are duel-targeted. Books that can be read differently as children and adults. When I read them, I can feel the difference in how I feel now and how I would have felt then (it helps that I have children I think - they tell me if I get the wrong impression, haha!). But the best children's books to me work on two levels. This review makes me want to go back & reread some of my favorite books from my teen & pre-teen years. And, maybe pick up Saplings - I remember hearing about it a while back, just needed to be reminded. Thanks & great & thoughtful review! I've never read this book, but it has such a cute cover! I'm curious, though. Many people seem to love Ballet Shoes so I guess I'll have to read it! I read the title of this post and was immediately transported to the scene in the movie of You've Got Mail where Meg Ryan is waxing profusely about the "shoe" books of Noel Streatfeild. I have not read them but plan to put them on the list of books to read when grandchildren come along. I've often thought about the difference between reading as a child and as an adult, and the difference I always focus on is summed up well in a word you use: larger. Books felt larger as a child - the world more real, the emotions more vivid, and so on. Not that books don't give me a similar feeling today (a whole different kind of book than then). I've never read this author I must admit, or at least not that I can remember, but she sounds intriguing. I'm intrigued with this book, and I love the book cover. Thanks for the lovely review, Ana! I'm afraid I had the same problem as Amanda. It must be an association of Noel with Noel Coward. I have not heard of this book, but the premise sounds most intriguing. I like authors who can switch back and forth between books for younger and adult readers. An admirable skill! Like Molly, I first heard of this book in You've Got Mail. I haven't read it, but I gave it to my niece for Christmas. I hope she enjoyed it! I haven't read the book, and I have to say I probably won't, but I have seen the movie! And it was pretty good, though I think I might have liked it more had I either been: a) a child; or b) someone who LOVED the book. I agree with you that it's a shame when books have that critical window for reading. I kind of felt that way about The Princess Bride - I didn't see the movie until I was 19 or so, and I didn't get all the hype. For me, the book was a similar experience. Now, I Capture The Castle is a completely different story, since I read that in my mid-twenties and loved it as though I were a much younger girl! There are some books that I've read as an adult and thought: Wow, I'd have loved this if I'd read it as a kid. It's always a sad feeling, even knowing that the books would probably not have aged well, and I'd have gone off them as a grown-up anyway. I'm starting a reread of all of Edward Eager's books, and halfway through Half Magic, I am impressed at how well it holds up. I hate going back to childhood favorites and finding the magic gone. Nostalgia can only do so much. I am curious about The Whicharts! I'd never heard of it before but would love to see the "dark side" of Ballet Shoes. Ballet Shoes was one of my childhood favourites, I read and re-read it, despite showing no aptitude for ballet at the lessons I was dragged to! But I did love watching the ballet with my Mum though. I've not been successful in getting my 9yr old daughter to read it, but she did like the TV adaptation with Emma Watson (the Hermione effect). I'm intrigued by The Whicharts though - never heard of it before, and would love to read it now. The TV production a couple years ago was absolutely wonderful! I haven't read the book but now I'd like to. This was one of my favourite books growing up, one I would read again and again. I hope to read it this year for the Flashback challenge. I have never heard of The Whicharts, though after reading your paragraph on it, I am not sure I want to. I don't want to ruin my love of Ballet Shoes. I just heard about this one recently. It was on Fuse 8's countdown of 100 top chapter (middle grade) books. Looks like I am going to have to read it! I totally agree that the reading experience for a book like this would be totally different for a child than for an adult. I've never read it, but it sounds good to me. I have not read this book..well I did not know about this one also. You are right, a books appeal and what it makes you feel is different at different ages and I also believe it is different when u re read it as well. I really want to read this one. Will look for it and I am sure it will be very tough to get it here! Ok...I really have to read some Streatfeild. Though I think I still want to start with Saplings. Every time I go into Barnes and Noble I see a copy of Saplings and I don't know why I haven't bought it yet!!! I remember Ballet Shoes and would like to revisit this book very much. I think I'll check the bookstore next time I'm there! I agree, its totally different when reading a book as a child as opposed to reading it as an adult. You take away different things from it. This one sounds good, I love that cover. Oh this is the book mentioned in You've Got Mail! That was my question but I see it answered here in the comments! I really would like to read this! I loved the shoe books! But I barely remember them. I really should reread them. I don't think books have due dates either, but I do think that adults and children get different things out of books: one isn't better or worse, just different. I get different things out of books at different stages of my life. That's one reason I often enjoy rereading books. I did not know this book as a child, but did read it with the CS as part of a mother-daughter book group several years ago.Interestingly, the moms all thought it was great--the girls tolerated it, but it clearly seemed dated to them. Pity. I have never read anything by this author, though I have heard a lot of glowing things about her work. I think I might enjoy this one, but I also wonder if, as an adult, I would miss some of the wonderment of the book. Great review Nymeth, I am glad that you enjoyed the book so much! I do think some books are for certain age groups--but that doesn't mean it's the same age for everyone. After all, you can stay immature indefinitely (that's my plan, anyway ;). I've been meaning to read this ever since I saw You've Got Mail, in which the main character recommends it to someone in a bookshop. I really need to get around to it this year. I first heard about this series in the movie You've got mail when Meg Ryan spells out the name of the author to the bookstore salesman. That is such a touching scene. When I was a child, reading Streatfeild made my world larger. I read and reread her novel Apple Bough and puzzled over some of the very British things in it. One of the things I remember learning from it--once I could jettison my mental image--was what it means to pass a test with "flying colors." I read Ballet Shoes when I was a little older and liked it, as I've liked everything by her. It doesn't have the place in my heart that the first one did, although it seems to be her most famous. I'd like to find a copy of the "adult version," which I'd not heard of before this. Verity, I really look forward to your thoughts on The Whicharts! JoAnn: I don't think it ever is :) The experience is different, of course, but not inferior. Chasingbawa: I can see what you mean about the uneasiness. Even though things do eventually go well, the possibility that they may not seems more real than in many children's books. Amanda: lol, that happens to me too sometimes. And yes, absolutely - the best are the ones that work on both levels. Elizabeth: Yes, do pick up Saplings! It was one of my favourite reads of last year. Emidy: I can definitely see why it's so well-loved - do pick it up if you have the chance. Molly: I've seen that movie, but it's been so long that I'd forgotten about that! Trisha: Yes, it takes a different kind of book to make you feel that you've jumped into a wide, endless world as an adult. Fantasy seems to me to do it more often than realistic fiction, which is part of the reason why I'm a fan. Jill: I like it too - especially when they manage to resist the temptation of writing down to children. Sadly, some adult's authors don't when they make the transition. Steph: Yes, I Capture the Castle is just ageless! I read The Princess Bride for the first time only a few years ago, but I think that because I hadn't grown up with the movie, I was able to take it for what it was and enjoy it still. Jenny: It is a sad feeling! As you know, I feel that way about Narnia, and it really makes me sad to have missed the chance to experience it as a child would. Gaskella: lol, the Hermione effect made me smile :D I'm curious about that adaptation now. Marieke: Now I'd like to watch it too! Vivienne: I understand - I might hesitate too if I had a childhood attachment to it. Lenore: I'm going to have to check out that list! Winstonsdad: A perfect choice for Persephone Week! Veens: So true - the difference isn't really just between childhood and adulthood. And I hope you do manage to find it! Bybee, I hope you enjoy it just as much the second time around! Naida: You do - and both are valuable experiences, but different. Sheila: I can't believe I had forgotten it was mentioned in that movie! Beth: Yes, definitely just different, and not limited to childhood versus adulthood as Veens also said. I need to read more of the Shoes books! ds: Oh, that is a pity! For me, the fact that parts of it were so clearly dated added to the charm - it was a glimpse into another time. But I doubt I'd have felt that way as a child, of course. Alice, I hope you enjoy it if you decide to pick it up! Violet: That does sound like a lovely scene! I can't believe I've forgotten it. Jeanne: That's so neat that you can remember where you learned that particular expression :) I love those kinds of reading memories. I saw and enjoyed the movie, so I've been curious about the book for awhile. I'll have to check it out (if I can find it!) Thanks for the review. I don't think I'd like to read a dark version of this book - I loved it too much as a kid. I also loved Dancing Shoes. I know I've read White Shoes, but I don't remember. Maybe I will have to re-visit this series as an adult. ps: Go Petrova! Loved her! I'm the publisher of "The Whicharts" and think it's a very good story in its own right. Yes, it's more cynical than "Ballet Shoes", but it was for an older audience and has the same humour and lovely characterisation.